Who can start a bankruptcy? What is the Chapter 7 "Means Test"? When may I file bankruptcy again? Is there any place I can get free or low cost legal advice before I file? Filing for bankruptcy is a serious matter. The consequences may outweigh the benefits. It is strongly recommended that anyone considering filing bankruptcy consult with an experienced bankruptcy attorney. The Oregon State Bar has a Lawyer Referral Service which will direct you to an attorney who has agreed to provide a limited consultation at reduced rates. Call (503) 684-3763 or toll free in Oregon at (800) 452 -7636. 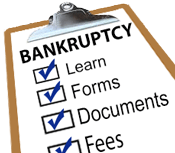 Anyone who is considering the filing of a Chapter 7 case can attend an informational Bankruptcy Clinic. Individual debtors who file for bankruptcy relief must receive a credit counseling briefing within 180 days before the bankruptcy filing. Court personnel are prohibited from giving you legal advice. Most debts are dischargeable in bankruptcy. However, certain individual debts may not be dischargeable. The most common examples are: taxes; domestic support obligations; student loans; most fines, penalties, forfeitures, or criminal restitution; debts for personal injury or death caused by your operation of a motor vehicle while intoxicated; and debts which were not properly listed on the bankruptcy petition and schedules. How do I obtain the required credit counseling before I file? Where can I obtain forms, and which ones do I need for filing? How much are the court fees to file a bankruptcy? Do I need to send a copy of the petition to anyone else? Read all documents before you file them with the Court to ensure accuracy. Your signature on many of the documents constitutes a certification under penalty of perjury that the information on the document is true and correct to the best of your knowledge. Failure to follow the laws and rules concerning bankruptcy (paying fees, filing documents, attending the meeting of creditors, etc.) may result in the dismissal of your case. If your case is dismissed, creditors may then resume collection efforts. You must list all of your property, belongings, and possessions, as well as all of your debts, on your bankruptcy petition. You must be completely truthful in your dealings with the Court and the trustee. False statements can result in your discharge being denied or revoked, and can subject you to criminal prosecution. I received a notice that I have a "deficient" pleading. What does that mean? How do I change or correct information in the petition, schedules and statements Ihave already filed withthe Clerk's Office? How do I get a hearing date? What does it mean if a case is dismissed? What if I don't agree with an Order entered in a case? How do I serve an adversary proceeding Summons and Complaint, motion or a Chapter 12 or 13 plan? What is the wording for a certificate of service? How do I get a copy of all or part of the record of a court proceeding or get a written transcript of it? What documents do I need to provide to the trustee administering my case? What is a 341(a) meeting or meeting of creditors? What can I expect will happen there? I received two notices for the meeting of creditors. Do I have to attend both meetings? What is an adversary proceeding and how do I file a complaint? Carefully read all documents you receive from the court. If your address changes, be sure to notify the court in writing immediately to ensure you receive important notices about your case! The case may be dismissed if you fail to appear at, and complete, the 341(a) meeting. Failure to pay all filing fee installment payments may result in a dismissal of your case. You must also complete the second required debtor education course financial management after filing in order to receive a discharge. The Court does not report bankruptcies to the credit bureaus and does not get involved in disputes regarding credit reports. Credit reporting agencies may not report a bankruptcy case after 10 years from the date of entry of the order for relief. Information about the Fair Credit Reporting Act is available from the Federal Trade Commission at www.ftc.gov or 1-877-FTC-HELP.